Abruzzo is one of the lesser known regions of Italy for tourists. It is situated in the central part of the country and lies to the east of Rome on the Adriatic Sea; its western border is only 50 miles from the Eternal City. Abruzzo borders the region of Marche to the north, Lazio to the west and south-west, Molise to the south-east and the Adriatic Sea to the east. Geographically, Abruzzo stretches from the heart of the Apennines to the Adriatic Sea and includes a significant amount of mountainous and wild land. Despite it being geographically, culturally and economically more of a central Italy, it is generally considered to be part of Southern Italy, a vestige of Abruzzo's historic association with the Kingdom of the Two Sicilies. It remains one of the most sparsely populated regions on the Italian peninsula. For those wishing for a time machine to travel back to see the unspoiled natural beauty of Italy, you need to look no further than here. To travel to Abruzzo and other southern regions is to witness an age-old Italian lifestyle that has not changed for centuries. Here you'll find ancient beechwood forests inhabited by wolves and bears, century-old pathways still used by colorfully-attired shepherds and their flocks and ominous castles which now guard nothing but desolate stretches of wilderness, where the only sign of life might be a soaring royal eagle or a lone family of mountain goats. Though thought of as a remote mountainous region, Abruzzo’s eastern border is marked by vast sandy beaches, stretching along the Adriatic north and south of Pescara. If you venture to the west coast, you will soon enter the hills which rise quickly to become the Abruzzo Mountains, dotted with some of the least visited hill towns in Italy. The mountainous inland is occupied by a vast plateau including Gran Sasso, at 9,554 feet, it is the highest peak of the Apennines and Mount Majella at 9,163 feet. Abruzzo is well known for its landscapes and natural beauties, parks and nature reserves, characteristic hillside areas rich in vineyards and olive groves. It is known as "the greenest region in Europe" since one third of its territory, the largest in Europe, is set aside as national parks and protected nature reserves. There are three national parks, one regional park and 38 protected nature reserves. It is is also home to Calderone, Europe's southernmost glacier. Until a few decades ago, Abruzzo was a region of poverty in southern Italy. However, over the past few decades it has become the most successful economic region of the 'Italian Mezzogiorno' (southern Italy), having the highest per capita income level in southern Italy, although it is still below the average of the north. The 2009 L'Aquila earthquake led to a sharp economic slowdown, but the region recovered quickly and by 2011 it had the highest percentage economic growth among the regions of southern Italy. Since the 1960s, Abruzzo's industrial sector has seen rapid expansion, especially in mechanical engineering, transportation equipment and telecommunications. This reflects the transformation of the economy from agriculture to industry and services. There are major institutes and factories involved in research in the fields of pharmaceutics, biomedicine, electronics, aerospace and nuclear physics. A further important activity is seaside and mountain tourism, which is of considerable importance to the economy of the region, while agriculture has succeeded in modernization and offers high-quality products. The small farms and vineyards produce wine, cereals, sugar beet, potatoes, olives, vegetables, fruit and dairy products. Traditional products in the region also include saffron and licorice. The most famous wine from the region is world renowned Montepulciano d'Abruzzo and in the last twenty years has achieved the stature of becoming one of the most widely exported DOC classed wine in Italy. Of cultural importance are a host of fascinating sites in the region. Abruzzo holds many of Italy's best-preserved medieval and Renaissance hill towns that rival those in Umbria and Tuscany. It boasts twenty of the most beautiful villages in Italy, second only to Umbria, which has twenty-two. These awards are for aesthetic beauty, art, culture, historical importance and livability. 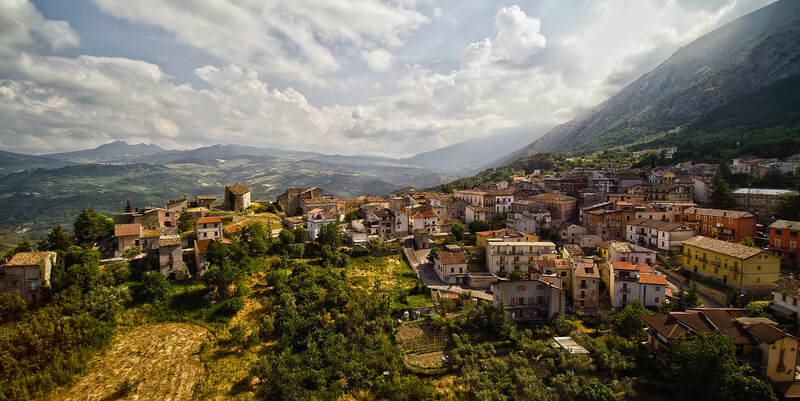 The decline of Abruzzo's agricultural economy in the early to mid-20th century saved some of the region’s most beautiful hill towns from the onslaught of modern development. Many lie entirely within regional and national parks. Among the most well preserved are Castel del Monte and Santo Stefano di Sessanio, which lie in the Gran Sasso National Park, nestled beneath the Apennines’ highest peaks. Both of these hill towns were ruled by the Medicis for over a century-and-a-half and have relatively little tourism. Between the two towns sits Rocca Calascio, the ruin of an ancient fortress that has become popular with film makers. Within the Gran Sasso National Park is also found Castelli, an ancient pottery center whose artisans produced ceramics for most of the royal houses of Europe. Monteferrante and Roccascalegna are two of the best representations of Abruzzo villages in the province of Chieti. The fortress of Civitella is the most visited monument in the whole Abruzzo region and Civitella del Tronto played a crucial role in the history of the unification of Italy. Other medieval hill towns located within Abruzzo's park system are Pacentro in the Maiella National Park and Pescasseroli in the Abruzzo National Park. Pacentro features a 14th-century castle with two intact towers and has had very few changes over the centuries. The Shrine of Gabriel of Our Lady of Sorrows, in the province of Teramo, with average of rwo million visitors per year, is one of the 15 most visited sanctuaries in the world. Renowned for its variety and richness, Abruzzo's cuisine is among the best in Italy, in fact a recent survey of foreign tourists indicated that it was the best Italian region to eat in. Both the agricultural and coastal aspects of Abruzzo have contributed to its cuisine. Due to the mountains, much of Abruzzo was isolated from international influence until the 20th century. As a result, the region’s cuisine remained unique. One of the most popular regional dishes is maccheroni alla chitarra which is made by pressing or cutting pasta through a chitarra, an implement to form long thin noodles similar to spaghetti. The pasta is served with a tomato-based sauce, often flavored with peppers, pork, goose or lamb. This dish is complimented by regional side dishes such as the bean and noodle soup, sagne e fagioli. This soup is traditionally flavored with tomatoes, garlic, oil and peperoncini. Other popular dishes include gnocchi carrati, flavored with bacon, eggs and pecorino cheese and scrippelle, a rustic French-style crêpe served either mbusse (a type of soup) or used to form a sort of soufflé with some ragù and stuffed with chicken liver, meatballs, hard-boiled eggs and cheese. The area has also had a long history of wine production. The most notable wine of the region is Montepulciano d'Abruzzo produced by the Montepulciano grape. It is a dry red wine and is often consumed young, rather than aged. It is known for its pepper and spice notes and low acidity. Although considered a “rustic” wine, it pairs beautifully with food, especially meats. Amongt Abruzzo historical people there was the Roman orator Asinius Pollio; Latin poets Sallust and Ovid, who were born in L'Aquila and Sulmona respectively; Gaius Cassius Longinus, a Roman senator and a leading instigator of the plot to kill Julius Caesar and Pontius Pilate, who was born in the province of Teramo and is best known for authorizing the crucifixion of Jesus. Abruzzo religious personalities include Saint Berardo, John of Capistrano, who led a crusade against the Ottoman Empire; Thomas of Celano, author of three hagiographies about Saint Francis of Assisi; Alessandro Valignano, who introduced Catholicism to the Far East and Japan and Pope John Paul II loved the mountains of Abruzzo where he would retire often and pray in the Church of San Pietro della Ienca. The greatest Italian poet of the 20th century, Gabriele D'Annunzio, was from Pescara. Other important people from the area in clude poet Ignazio Silone, philosopher Benedetto Croce, composer Sir Paolo Tosti and the sculptor Venanzo Crocetti. American artists and celebrities such as Madonna, Dean Martin, Perry Como, Henry Mancini, Rocky Marciano, Al Martino, Mario Lanza, Mario Batali, Penny Marshall, Tommy Lasorda and Dan Marino all have origins in Abruzzo. Check the original article on The Italian Tribune website.